18 Gauge Closed Steel Commercial Shelving - Material Handling Equipment Product Information - 18 Gauge Steel 8 Shelf Closed Shelving Units. 18 Gauge Steel 8 Shelf Closed Shelving Units. 18 Gauge Steel 8 Shelf Closed Shelving Units are heavy duty commercial grade shelf's that are perfect for a variety of purposes. Closed Shelf units use panels to enclose the side and back of the shelf which gives greater stability as well as greater protection for the items you are storing. 8 Shelf closed shelf steel shelving units are perfect for any office setting, ideal for where product containment is essential, closed shelving provides a rigid and durable storage structure. Closed steel Shelving can also be converted in to bins by adding sections in between the shelving to make bins. Perfect for storing nuts and bolts and various smaller materials that need to be kept separate to keep order. 18 Gauge Steel Closed Shelving comes in a 36inch width only. If you need something wider then please have a look at our 18 gauge steel closed shelving units which come in 36, 42 and 48 inch widths. 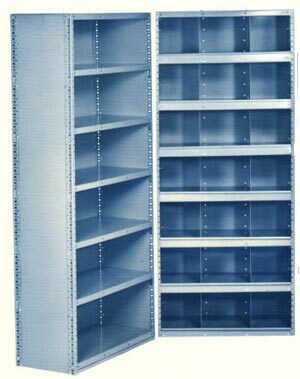 18 gauge steel closed shelf units are currently available in the following sizes: 36X12X85, 36X15X85, 36X18X85, 36X24X85, 36X30X85, 36X36X85, 42X12X85, 42X15X85, 42X18X85, 42X42X85, 42X30X85, 42X32X85, 42X36X85, 48X12X85, 48X15X85, 48X18X85, 48X24X85, 48X30X85, and 48X36X85. If you need a special size please contact us and we can work up a quote for you. 18 Gauge Steel 5 Shelf Closed Shelving Units. Notify me of updates to 18 Gauge Steel 8 Shelf Closed Shelving Units.